Make your own custom photo apron! 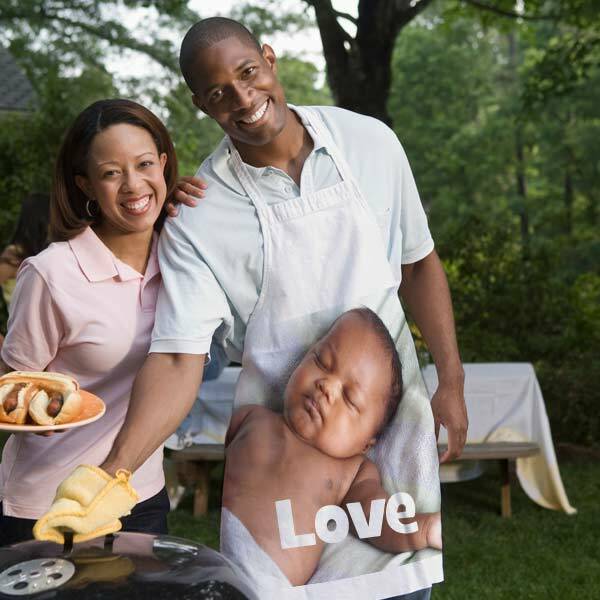 Proudly wear your favorite photo while grilling or preparing dinner for your family. Design a photo apron for yourself or your favorite cooking connoisseur for a unique thoughtful gift. Begin your personalized apron design by collecting your photos from your computer or phone. Once you have decided on which photo you would like to use on apron, you can easily make your own apron online with just a few simple steps. If you’re looking for cheap custom aprons with a personal touch; look no further than MyPix2! Start your customized apron by first uploading your photos. In the project builder, just drag and drop your photo into the provided space and add optional text. When you’ve finished your project, add it to your cart to place your order. After receiving your apron in the mail, you can put it on while cooking your favorite meal or entertaining friends and family at your next dinner party. Our photo aprons are a great way to add a little personality to your cooking routine. Maybe you have a few ideas about which photos you’d like to display on your personalized cooking apron. Why not create a collage of memories from years past to tell a story about your best moments. Add your favorite wedding photos, your kids’ best snapshots, favorite vacation pictures and more to give your apron a truly personalized look along with choosing a background to accent your photographic memories. You can regale you family and friends with your treasured memories while preparing a special dinner just for them. Create an apron with photos printed to your liking using our project builder. We have twelve different styles available to compliment your photos. Once you have chosen your style you can further customize it by creating your own photo arrangement along accompanied by personalized text that includes your name or a fun quote. Make a photo collage apron using our full photo layout option. Printed edge to edge, it’s a great choice if you don’t want any background color or pattern behind your digital image. If you want only photos on your apron but can’t decide on a favorite, we also have a photo collage option so you can display an arrangement of you most cherished photos. If you’re looking to add an accent to show off your pictures, we have dozens and dozens of templates to pick from including floral patterns, pet themed designs, camouflage, solid colors and more. You’re sure to find a background accent that suits any custom designed photo layout. Whether it’s during the holidays or a loved one’s birthday, our custom apron makes a great gift for any kitchen connoisseur. Upload your loved one’s favorite photos to MyPix2 to start your design. Our personalized photo aprons pair perfectly with our laminated photo placemats or our personalized photo cutting board. Find your loved one’s most cherished photos and design them a unique dining accessory that’s as practical as it is heartwarming! Maybe you’re looking for a fun, unique gift for Mom on her birthday. 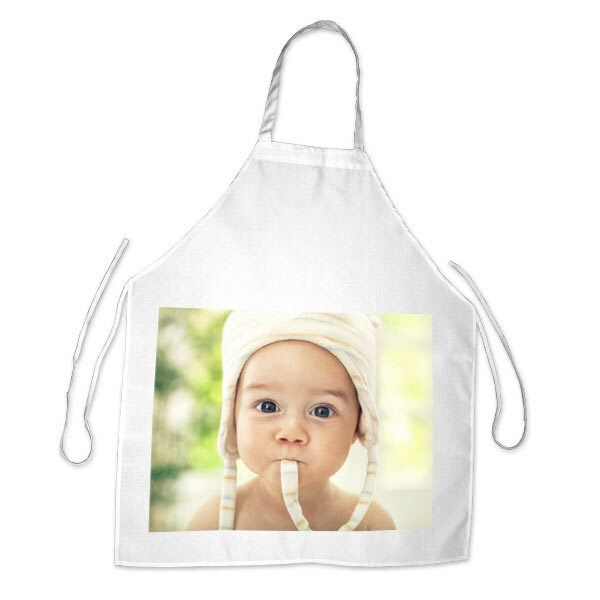 Since Mom loves cooking and baking, why not get her a custom apron that showcases her favorite favorite photo. Add Mom’s favorite family picture from past vacations, birthdays, holidays and more to give it a personalized flair. Personalized aprons make a great gift for anyone who enjoys cooking. You can add their favorite photos from the family album or upload their favorite social media pictures for a gift that’s sure to bring a smile to their face. Using our apron designer, you can make a photo apron creation that is uniquely their own. With a variety of custom options to choose from, you can create the ultimate photo apron for yourself or a loved one. You can also fully customize your own apron by selecting from a dozen different styles that are suited to anyone’s taste. Print a full photo apron, a photo collage arrangement or accent your pictures with a fun, colorful background pattern. Using your own photos and little creativity, you can design a special kitchen accessory that is sure to turn heads. Even better, our customized aprons can be designed with ease using our project builder. Whether you’re looking for an apron that has a little character or a unique gift for Mom’s birthday, our personalized aprons are guaranteed to please!